Iowa Wild issued the following announcement on March 21. Iowa Wild (34-19-7-5; 80 pts.) blanked the Tucson Roadrunners (28-23-5-2; 63 pts.) by a score of 2-0 Wednesday night, dropping the team’s magic number to clinch a playoff spot to 13. Goaltender Kaapo Kahkonen (24 saves) earned his sixth shutout of the season in the contest, tying Syracuse’s Connor Ingram for most in the AHL. After a scoreless first period, Iowa took a 1-0 lead as forward Mitch McLain potted his 10th goal of the season. After a miscommunication between goaltender Adin Hill (24 saves) and the Tucson defense, McLain stole the puck behind the net and gave it to forward Dmitry Sokolov on the close post. Hill stopped two attempts by Sokolov before McLain started chopping at the puck, eventually pushing it over the goal line. Defenseman Matt Bartkowski recorded the secondary assist on the goal at 4:28 in the middle frame. The Wild took a 2-0 at 15:04 in the second period. Forward Cal O’Reilly shuttled a puck to forward Gerry Mayhew in the slot, who blasted a one-timer on goal. Forward Will Bitten deflected Mayhew’s shot past Hill and into the back of the net for his eighth of the season. O’Reilly’s assist was his eighth consecutive game with a helper, setting a new franchise record. His assist also gave him 15 points (3g ,12a) in his last eight games. Through 40 minutes of play, Iowa led 2-0 and shots were tied 16-16 after Tucson had a 7-3 shot advantage at the end of the first. 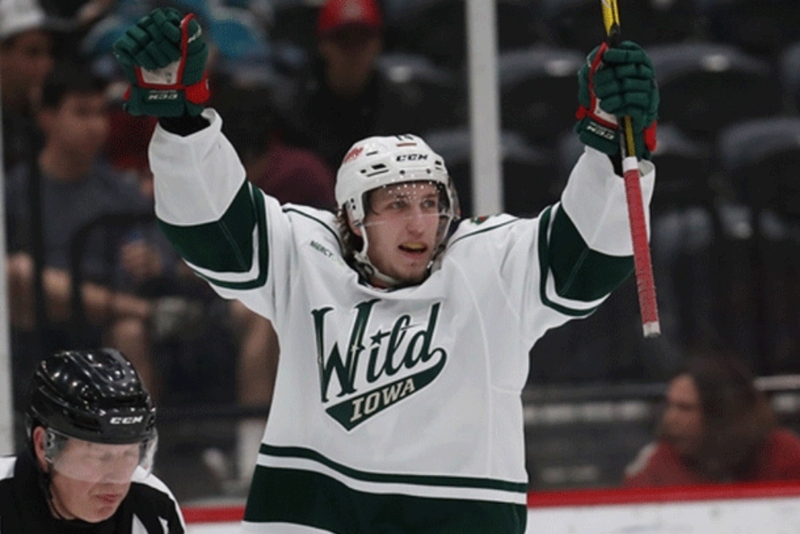 Tucson couldn’t solve Kahkonen in the final 20 minutes and at the final buzzer, the Wild got back in the win column and dropped the team’s magic number to 13 in the process. Both teams went 0-for-2 on the power play and Iowa outshot Tucson 26-24. Iowa returns to the ice Friday night as the team takes on the Stockton Heat in California. Puck drop is scheduled for 9:00 p.m.